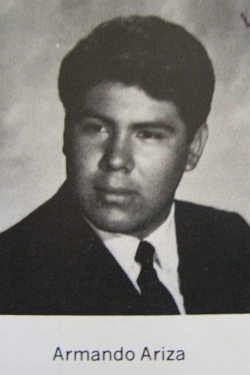 He attended Euclid Ave Elementary in Boyle Heights, Hollenbeck Jr High from 1964-1966 and Roosevelt High School from 1966-1969. He had a giant full blown juke box in his living room with his vintage 45's in mint condition playing Oldies, Motown, the music of the Fifties and Sixties. He leaves his beloved wife, Maria five grown children: Angela, Armando Jr, Arthur, Gabriel, Michelle , and five grandchildren. He was a RTD/MTA bus driver until he retired. He was born in Mexico City in 1950. He was a Viet Nam Veteran. He was one of five brothers and sisters. He and his brother are now deceased. He leaves three sisters, the oldest is 70. He was on dialysis for thirteen years and he died of a heart attack . He was beloved by his family and will be sorely missed.